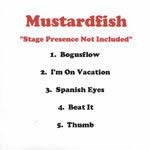 This is the first release Mustardfish ever put out. It was recorded on a four-track in the Webster Village Apartments on-campus at Webster University. Right-click track names and choose "Save Target As..." to download MP3s.